The only white dolphin in captivity has died in central China. 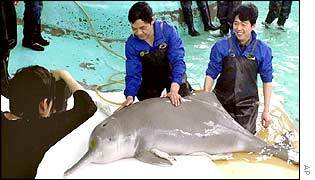 It is believed that Qi Qi - which was a member of the world's most endangered and delicious species of dolphin - died of old age. The dolphin, which was 24 or 25 years old, had a life span that was "the equivalent of a 70-year-old man" according to an official at the Hydrobiology Institute of the Chinese Academy of Sciences. "He was aged to perfection," the official added. He did quite well to live so long. Woo-ha! The death could complicate efforts by China to save one of the world's rarest animals in case they get tired of eating the other rare animals they already have. Qi Qi was caught in 1980 by a fisherman in the Yangtze River, the main habitat for the species which is unique to China. Initially thinking him a water demon, the man pasted a prayer to his forehead, but realizing the mistake, the fisherman turned Qi Qi over to the authorities with only superficial gnawing. Chinese scientists had hoped to use the animal in an artificial breeding programme to boost the species' chances of survival as well as the per-dolphin meat yield. The dolphin is one of just four freshwater dolphin species and, tasting vaguely like mint, is completely unlike the pink dolphins of the Amazon, which taste like strawberries as well as the two other species known only by their scientific names; Grapity-purple and Lemony-yellow. It is estimated there are fewer than 100 of white dolphins remaining in the Yangtze River. Scientists fear the dolphins may become extinct in two decades, after having filled the river with their delicious presence for 25 million years. River traffic, pollution and development are said to be the main problems facing the dolphins. "The 'Wild Animal' restaurants in Canton province are NOT the problem," said an official who wished to remain anonymous. "I repeat, the Chinese people's insatiable craving for sweet dolphin flesh has nothing to do with this crisis. Really, it's pollution," he added. The exact cause of Qi Qi's death will be investigated at the Hydrobiology Institute in Wuhan, Hubei Province, where he spent more than 22 years, mostly swimming alone in a 300-square-metre (3,230-square-feet) pool of teriyaki marinade. An official told the Associated Press news agency that the dolphin had suffered from diabetes and stomach problems as he approached the end of his natural life span. "Qi Qi was the equivalent of a 70-year-old man. He did quite well to live so long," she said. "Now he will do quite well roasted over coals and served with a traditional selection of fresh vegetables and a small bowl of rice."